As some artists jump ship, top creatives debate the side effects of social media. Likes. Retweets. Upvotes. They’ve all become common ways to gauge the popularity of our thoughts, and for those in the creative industries, our work. But are sites like Facebook, Twitter and Instagram a blessing or a curse for artists? Just like any innovation, it all depends on how you use them. If you’re monitoring the performance of your latest status before you go to bed, it might be time to reassess your relationship with social media. However, when used right, these platforms can reap amazing rewards. “I’ve discovered so many new artists who inspire me every day just from their social media posts,” says illustrator and Marvel comic artist Jen Bartel, who also uses social media to get her work in front of potential clients. “Working on comics often means working long hours in isolation, and finding those connections online is such an amazing lifeline for many of us,” she says. For Art Camp founder Noah Bradley, social media has overtaken traditional routes to exposure. It isn’t all about business, though. 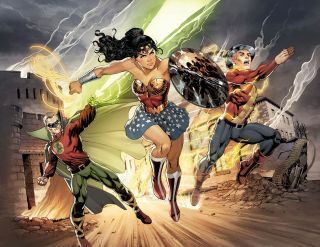 For Sydney-based Wonder Woman artist Nicola Scott, living on the other side of the planet to where the rest of the industry is located feels less isolating thanks to social media. However, there’s more to managing a social media presence than willpower alone. With online profiles blurring the line between where a person ends and their work begins, it’s important for artists to make clear the distinction between the two. Yet even the best intentions can slip after a while. For artists struggling to use social media constructively, there are a few options to consider. Scheduling updates through tools such as Hootsuite, TweetDeck or Buffer takes away the distraction of endlessly updating feeds. Users can simply plan their content in one batch and then check back in to take care of replies whenever suits them. Another option is to set up a dedicated artist account across all platforms, while keeping personal profiles separate. This is a popular way to contain thoughts and opinions that don’t need to find a wider audience. Although a batch of accounts isn’t for everyone. Artistic productivity isn’t always hindered by social media. In fact, the platforms provide a useful way to work out a draft. “Sharing WIPs with followers usually gives me a sense of how people will respond to the final artwork,” says Chaisson. Even with their tendency to play with algorithms and change how users see posts, social media sites remain popular with artists. “Social media gives artists publicity that enable us to show our art to people around the world – which is pretty incredible if you think about it,” says Chaisson. For artists, this publicity can be a revenue lifeline. “I think that just speaks to the fact that artists are being increasingly devalued in the internet age, so any potential revenue streams are worth exploring,” says comic book artist Staz Johnson. Nothing’s perfect though, and following a recent migration of artists to the promising new pastures of ad-free social media site Vero, Bartel thinks a chronological timeline is what creatives are crying out for. Ultimately, Bartel still thinks that social media can be a force for good. “Before social media, artists had to rely a lot more on getting their work published through official channels. Now we control how much content we put in front of our followers. This article originally appeared in ImagineFX issue 160; subscribe here.